Having been bitten by the delights of a Foreign Key(FK) with NOCHECK I thought it time to do a little digging. I’ve always been aware of the perils of this option but have encountered a table with this feature and I was caught out by it. I’m also aware of the impact it can have on the Optimiser but I’ve never looked into it, so I’m taking this opportunity to look at the impact there too. Basically, it allows you to add a constraint onto a table without validating the existing contents of the appropriate column. So, for example, I can create a FK constraint for a column against a reference table even though not all of the values currently held will match against that reference table. And you’d be right, as long as I didn’t specify ‘NOCHECK’. And the Foreign Key has been created. Because the constraint now checks that column against the reference table. Data that was in that table now cannot be re-inserted, unless I remove the FK constraint, run the insert and then add the FK back. This shows what values are currently breaking the constraint and will need dealing with before you can change the constraint to ‘CHECK’. Another, ‘quieter’ issue with using NOCHECK is that the Optimiser ignores Foreign Keys that have that option specified. Looking at sys.foreign_keys, there is a property ‘is_not_trusted’, and for a FK constraint with NOCHECK this is set to 1. It implies that the data in that column cannot be trusted to be valid, when comparing it against the column that it references. Removing the invalid data won’t fix this, but removing the invalid data and changing the FK constraint will. –Table ‘Locations’. Scan count 0, logical reads 8, physical reads 0, read-ahead reads 0, lob logical reads 0, lob physical reads 0, lob read-ahead reads 0. –Table ‘StockItems’. Scan count 1, logical reads 2, physical reads 0, read-ahead reads 0, lob logical reads 0, lob physical reads 0, lob read-ahead reads 0. So, where the Optimiser can trust a FK constraint it can make improvements to the efficiency of the plan. NOCHECK does have its place, but the impact to performance and behaviour needs to be understood before using it. In a previous article I showed a basic example of Partition Switching, using animal names (http://wp.me/p3Vxvi-2u). While not a realistic example for everyday use it did get the principles across. However, certainly in my experience, partitioning is normally dependent upon a number – usually a date. In this article I’ll create a partition process that is used to keep data for three days (based upon a date within the row) and then remove the data automatically, via a job. Firstly I require a database for this demonstration. Now I need a Partition Function. Because there can only ever be 3 possible values with this calculation, I can be a little lazy and just specify two of the values. If I just write the function for values of 1 and 2, then 3 will always go into the third partition, normally used for ‘invalid’ value ranges. I can’t have any invalid values (provided it has been coded and tested properly), so use the third partition for the ‘normal’ work instead of out-of-range values. The associated Partition Scheme will have three partitions. Values of 1 will go to the first in the list, values of 2 will go to the second in the list and all others will go to the third. There are only ever going to be three values for this example, so I won’t worry about a fourth for invalid values. Notice that the PartitionNumber column is a calculated, persisted column. This value is based upon the LogoutDatetime, so will be kept for three days from that Datetime value. So let’s start with the basics and build up from there. Substitute the ‘LogoutDateTime’ with an ISO standard date, to help show what is happening. Using a Base Date (in this case the 1st of January 2000) calculate the number of days between then and 20150310. Of course you need to set a Base date that you will suit your purposes. In this case should I ever have a date in 1999 or earlier then it will not work as expected. From these result it can be shown that the PartitionNumber column is never outside of the range 1, 2, 3 and the partitions themselves match the data spread indicated by the value of PartitionID. The three rows in Partition 2 have been moved to the Partition_Switch table. So, I know that the structure of the tables is correct and that we can switch partitions. The next step is to create a routine that will perform this action automatically. Our table is designed to keep data for three days, and to do this successfully we need to make sure that the next partition we are going to need (tomorrow’s partition) is empty before that day starts. So just before midnight we need to remove the data that is about to become four days old. A Stored Procedure is now required – ‘dbo.Purge_Table’, which ascertains the partition number that is now three days old and purges it (after some checks to make sure it should), because that will be the partition required tomorrow. 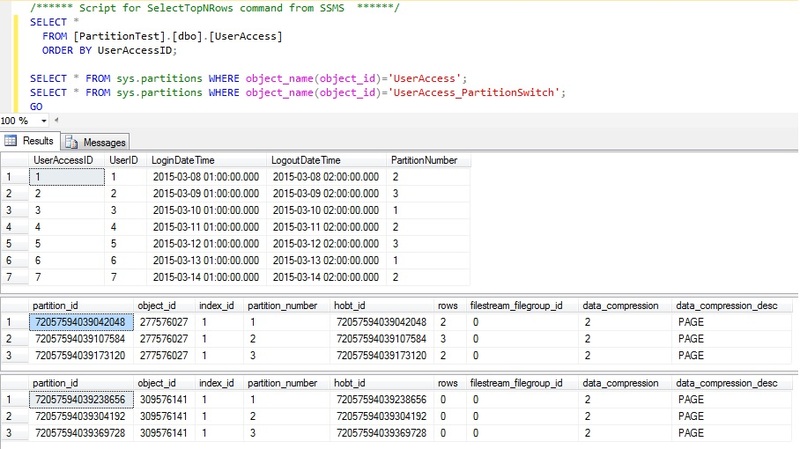 Now execute the Stored Procedure and the row in partition 2 should be switched to the PartitionSwitch table and removed (based on the execution date of 20150316). Now all that is required is a scheduled job that executes this Stored Procedure at the end of each day, ensuring there is always an empty partition available for the next day and any data older than is required is no longer stored.